The 5.7L Hemi engine was the first Hemi engine produced with the re-birth of the hemi engine family. The Hemi engine was previously available from the 50s-70s, but the 5.7L Hemi marked the re-introduction of this popular engine. The name Hemi is originated from the design of the combustion chamber and cylinder heads. The hemispherical design provides an efficient combustion and reduced heat loss. Although the Hemi design or a slight variant is used by other manufacturers, the marketing name Hemi indicates an engine built by Chrysler. This engine is available for purchase in several Dodge models, including the Ram, Durango, Magnum, Charger, and Challenger. The engine is also available in the Chrysler 300/300c, Chrysler Aspen, Jeep Grand Cherokee, and Jeep Commander. The 5.7L Hemi was introduced in 2003, replacing the Magnum 5.9L in the Dodge Ram pickups and the 8.0L in the Dodge Ram Heavy Duty. The 5.7L has gone through two phases with this introduction. The first generation was from 2003 and is still used in some applications today. The second generation of the Hemi was created with a number of modifications in 2009. Some of the major modifications include Variable Camshaft Timing (VCT), which is very similar to the variable valve timing as it is called by other manufacturers, as well as Multi-Displacement System (MDS), which essentially the same as active fuel management and displacement on demand. This engine design has lots of power and with the hemispherical design along with VCT and MDS offering increased efficiency, this engine is consistently one of the most popular. In fact, this engine made the Ward’s 10 Best 2003 through 2007, and then again in 2009 with the modified engine. The original 5.7L Hemi introduction in 2003 featured a horsepower number that matched its displacement in cubic inches exactly, 345. This one to one ratio of horsepower to cubic inches is something that was also common in the original Hemi versions, although the horsepower calculation used then was different. The 2003 version of the 5.7L had a peak torque measurement of 375 lb-ft at 4400 RPM. With the upgrades introduced in 2009 including the previously discussed VCT as well as other improvements, such as increased compression ratio, improved air flow, and an active intake manifold, the horsepower was increased significantly. The 2009 version was able to reach up to 390 horsepower and 407 lb-ft of torque. This engine had a bore of 3.92 inches to go along with a stroke of 3.58 inches. The Hemi engine uses cast iron block to go along with its aluminum cylinder head. The intake manifold is plastic. The pistons also use an alloy eutectic design for increased strength. The valvetrain is a pushrod camshaft in the block system with 2 valves per cylinder. Due to the engine’s hemispherical design, only 2 valves per cylinder is possible, but it does allow for larger intake and exhaust valves, ultimately increasing airflow. The valve springs use a beehive style design which enables lighter springs. The 5.7L Hemi introduced in 2003 was a revival of a great Chrysler engine that was previously obsoleted in the early 70’s. Bringing this engine back has proved to be a great success, clearly seen by the run of 6 Ward’s 10 Best Engine awards between 2003 and 2009. 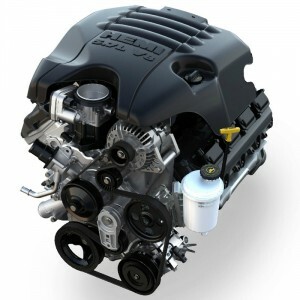 This engine offers many of the latest technologies available, along with its efficient hemispherical cylinder design. The Chrysler Hemi engine family is a consistently strong engine and is certainly a strong selling point for the vehicles in which it is offered.